At the time we didn't have children, so we didn't realize that fireplaces were also baby magnets. They sell fireplace screens and grates. They also sell metal or glass doors that can be installed into the fireplace to make them safe and more "off-limits". Most of these cost (surprisingly) hundreds of dollars. And I really didn't want to screw anything into the fireplace surrounds (brick and wood) knowing they would only be temporary. So I searched for baby gates that would fit inside the fireplace, but they were hard to find - every baby gate seems to advertise "extra long" or "extra tall". I needed a pretty narrow baby gate that was also short enough to fit inside the fireplace opening. 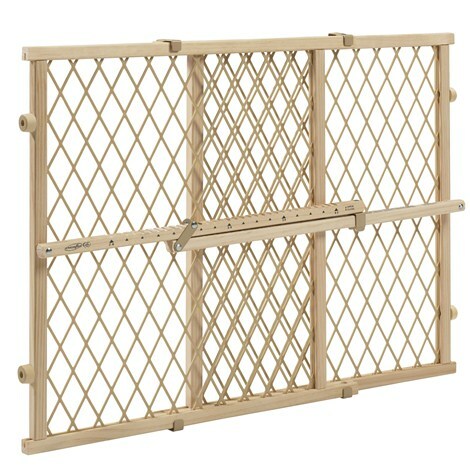 So after perusing the web for hours and coming up with nothing I stumbled upon these very cheap gates at Burlington Coat Factory. I had seen others similar to these, but most were too tall. They aren't the prettiest, but they do the job. I told myself that I would spray paint them black so that they would blend in. I haven't done that yet. I would still like to get around to it at some point, but for now I am just happy that Eliana is not able to crawl into our fireplaces! ******UPDATE***** I spray painted the baby gate. It does look so much better painted black - better than I thought - it blends in so well that I sometimes forget we have a baby gate there! See pictures below! I put the adjustable arm on the inside so she can't get to it. I think the only area I need to child-proof now is our steps down to the basement...wish me luck!